I recently Gave a presentation about Frome Salmon and Sea Trout fishing West Stafford Village hall. The night was attended by a number of keen anglers who fish the middle and upper river mainly for Brown Trout and Grayling. This first Talk was Given by Alan Frake and was about “Chalk streams, Past, Present and Future”. After the evening a few of the people present got in touch to enquire about fishing etc. 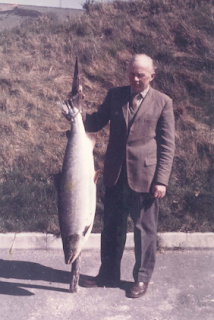 One of the people present send a great picture of his Father with his largest Frome Salmon - a Cracking fish of 38lbs. I wonder if there are still the odd fish like this lurking in the frome? The fish was caught by John Miller just below Moreton house in the 70's Mr Millers best day on the Frome was 11 fish! bearing in mind the Frome was onry really fished in the spring in those days they would have generally been in the 20lb - 30lb bracket, imagine that! Thanks To Richard Miller for sending this picture! Roll on Sunday I say, hopefully the spring tides will bring in a fish of two!